With Sinch SMS Notifications for WooCommerce you can easily send automated SMS notifications via the Sinch SMS platform to both customers and the website shop owner(s)/manager(s). Connecting your WooCommerce store to Sinch is easy; simply enter your Sinch key and secret into the plugin settings and off you go! SMS notifications is the best way to keep customers in the loop. SMS messages have a 95% open rate and are read within 5 seconds! You can’t say that about emails! Sinch SMS is super easy to setup compared to other SMS services like Twilio and server the international market better. With Sinch you can create a free test account and there are no monthly fees or commitments. Did I mention that Sinch’s SMS costs are very cheap! and you can reach more customers with access to the largest tier 1 network with over 200 direct carrier relationships with unparalleled security and compliance. Send a new order SMS notification to one or more mobile numbers or turn this feature off in the plugin settings. Customise the message with dynamic shortcodes to get the information you need to your mobile. Send SMS notifications to customers when their order status changes. 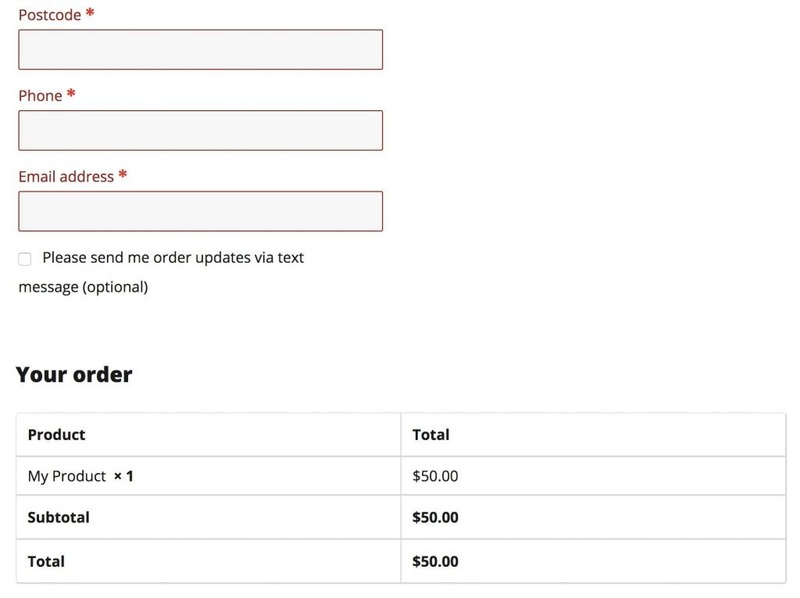 You can easily add an opt-in checkbox with a default option of your choice to the WooCommerce checkout page or remove the opt-in checkbox altogether and have order SMS notifications sent to all customers. You can choose what order status changes will trigger the SMS, for example you can turn on and off notifications for the following statuses: pending payment, processing, on hold, completed, cancelled, refunded, failed and for each status you can create a custom message with dynamic shortcodes as well as a default fall back message which will apply to all messages without a custom message. As well as simply informing customers of order status changes you can be creative! Why not create a custom message when the order is completed to give customers a coupon code for X% off their next order. WooCommerce doesn’t restrict heavily what is entered in the billing phone field but Sinch requires a strict format for the phone number. Sinch SMS Notifications for WooCommerce will cleverly parse the phone number entered by your customer, so if they enter 0400123123 or 61400123123 or +61400123123 the message will still send. At just $20USD, the Sinch SMS Notifications for WooCommerce plugin provides a simple but powerful method to send automated SMS’s using your existing or new Sinch account. Sinch SMS Notifications for WooCommerce includes free updates for 1 year and the plugin can be renewed for continual updates if necessary. WooCommerce, Sinch and WordPress are separate products and not owned or managed by Northern Beaches Websites. The price of the plugin does not include the price to send SMS’s or any other fees that may be associated with Sinch. To learn more about SMS pricing please click here. Please read the terms and conditions for Sinch SMS Notifications for WooCommerce here.